Why have a Rioblush Carboxytherapy treatment at Therapy House? RioBlush carboxytherapy – also known as CO2 therapy – is an innovative treatment that stimulates your own cells to naturally produce nutrients, collagen and elastin so that your body can repair itself. This treatment has been proven to dramatically improve panda eyes, tighten jowls, heal scars, reduce stretch marks, and fight the appearance of cellulite. It is also used to help encourage hair growth if you are currently experiencing hair loss. RioBlush is used to treat stretch marks, fine lines around eyes and mouth, dark under-eye circles and to tighten and rejuvenate the skin around the face, neck, and décolletage. It can also be used to treat localised fat deposits that accumulate in and around the chin, arms, knees, abdomen, thighs, buttocks, back and hip areas. It has been shown to be an effective treatment for cellulite reduction and for stimulating hair growth. As we age, subcutaneous capillaries become dormant, decreasing your circulation and depriving cells of oxygen; this, combined with environmental stresses and other factors, inhibits the ability of cells to regenerate and function properly. RioBlush’s RioJuvenation System infuses carbon dioxide (CO2) just beneath the skin’s surface; the body interprets this as an oxygen deficit and responds by increasing the flow of blood. This provides a surge of oxygen and nutrients to the treated area and improves circulation, resulting in cell restoration and the production of new collagen. Carboxy therapy has also been proven to destroy fat cells, while making your skin look renewed and firmer. What issues can RioBlush carboxytherapy be used to treat? How can RioBlush carboxytherapy help with hair loss? An emerging area of research and use for RioBlush carboxytherapy is as a method for stimulating the hair follicles to treat Androgenetic Alopecia. By encouraging more oxygen and better blood flow to the hair follicles in the scalp, it is possible to achieve noticeable hair regrowth. What happens during a RioBlush carboxytherapy treatment? Before your treatment begins, we will apply a local anaesthetic cream to numb your skin. Then we use a fine, hair-like needle to pass carbon dioxide into targeted areas. 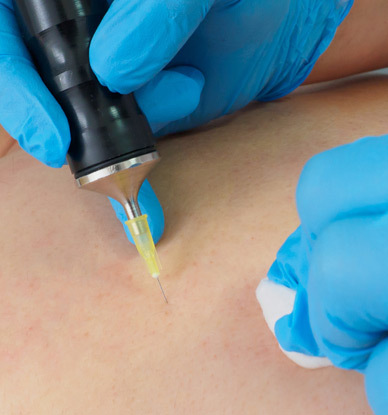 The injections are superficial and as the gas enters your body, your skin will distend slightly. It typically takes 20-30 minutes for this distention to subside. If you’re having treatment for stretch marks, for example, you’ll be able to see the gas travelling along the damaged, scarred areas of skin. By gently re-traumatising the cells with CO2, it will stimulate your body’s natural healing process to boost your blood flow, trigger collagen production, and cause cell regrowth. During the treatment, you may experience mild discomfort or a slight burning, itching, or tingling sensation followed by a feeling of warmth in the treated area. The Rioblush Carboxy Therapy system allows for heated gas, which makes it more comfortable. How soon should I be able to see the results of my RioBlush carboxytherapy treatment? Most people observe improvement after the first treatment, although it usually takes up to one month for the body to properly react to the process. More pronounced and long-lasting results are observed after four to 12 treatments, by which time your skin should show clear signs of healthy rejuvenation. 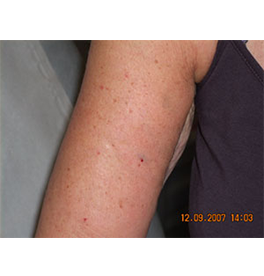 Depending on the focus of your RioBlush carboxytherapy treatment, the effects can be permanent – i.e. 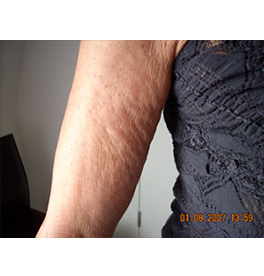 for stretch marks – or last for several years in the case of skin tightening, but the treatment does not stop the ageing process. Regular maintenance treatments every six to 12 months will extend the benefits. Carbon dioxide is a natural by-product of the body and, therefore, not toxic – this means that this treatment has incredibly low risk of side effects. Some people may experience some mild discomfort but most find it less uncomfortable than electrolysis, laser, or waxing. Most people find they don’t need any downtime after this treatment, but if you do have areas of skin that feel tender or distended, you may want to take some time for these symptoms to subside. Generally speaking, after RioBlush carboxytherapy, you will be advised to avoid strenuous activity, bathing or saunas for four hours post-treatment. Want to know more about Rioblush (Carboxytherapy)?